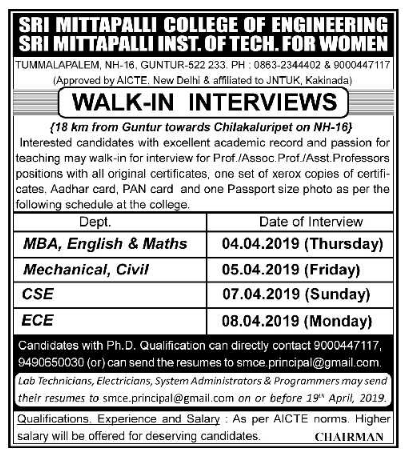 Sri Mittapalli College of Engineering, Guntur has advertised in EENADU newspaper for recruitment of Professor / Associate Professor / Assistant Professor jobs vacancies. Interested and eligible job aspirants are requested to walk-in on 04th, 05th, 07th and 08th April 2019. Check out further more details below. About College: Sri Mittapalli College of Engineering, a premier technical institution was founded by towering personality of impeccable credentials, a notable academician, with grand mission and noble vision Sri.M.V.Koteswara Rao in the year 2006. The college is approved by All India Council for Technical Education (AICTE) affiliated to JNTU Kakinada and functions as a private self- financing institution under the auspices of Sri Mittapalli Trust. How to Apply: Interested and eligible candidates are requested to appear for Walk-in interview along with all original certificates, one set of xerox copies of all certificates, PAN card, Aadhaar card and Passport Size photographs to the walk-in address provided below. Ph.D candidates can contact 9000447117, 94906650030 or send applications via email address provided below.